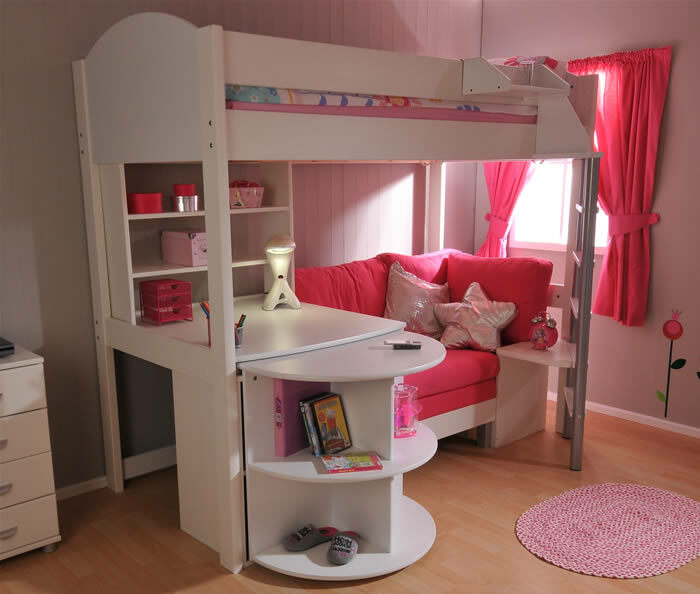 The Stompa Casa 4 high sleeper bed is available in a modern white frame with a variety of gable ends and sofa colours to choose from. The ladder to the Casa 4 sleeping area has two sturdy tubular metal uprights and wooden steps for safe access. The Stompa Casa 4 sofa extends into a 2 meter foam guest bed with a handy side table, the sofa's cushion are available in a choice of three colours, black, pink and silver. 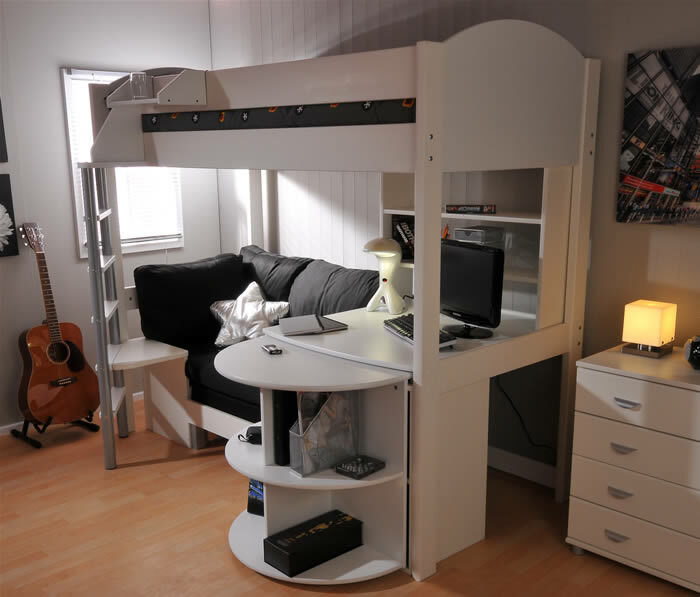 To assist your child's study time the Stompa Casa 4 offers a pull out desk plus a fixed surface top with plenty of space to accommodate a computer monitor or flat screen television. For extra bedroom storage the Casa 4 comes with a bookcase shelving unit for at the back of the fixed desk, 1 stompa four cube unit and additional shelving found at the end of the pull out desk. 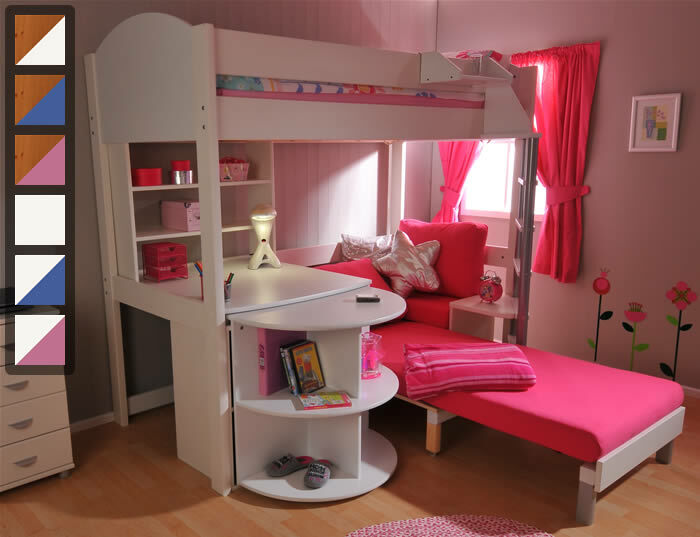 For maximum bedroom compatibility the Stompa Casa 4 loft bed features a reversible assembly layout allowing the ladder and sofa to be positioned to the left or right side of the bed. 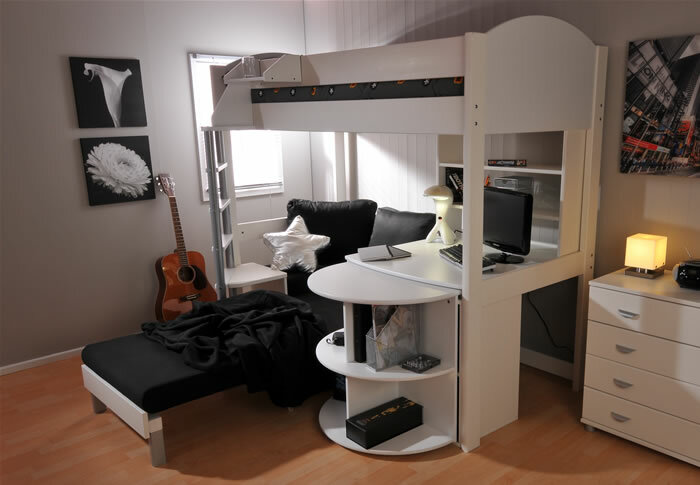 The fixed desk, desk top shelving unit and pull out desk can also be assembled on the left or right side of the bed. The four cube unit pictured below the fixed desk is a free standing piece of furniture and can be positioned to suit your child's needs. Handy optional Stompa clip on shelves and cube unit doors are available in a choice of 3 colours. Free Local Fast Delivery 1 to 5 Days. Free None Local UK Mainland Delivery 1 to 4 Weeks. This product is delivered flat-packed with full assembly instructions. Peace of mind when you shop online using our secure basket, checkout and payments.